"With the right white man, we can do anything." From iconoclastic filmmaker Spike Lee and producer Jordan Peele comes the unbelievable true story of how the first African-American cop in Colorado Springs history infiltrated his local chapter of the Ku Klux Klan. Based on the bizarre real-life happenings and memoir by retired undercover detective Ron Stallworth, BlacKkKlansman is a messy yet comically riotous dramatization of racial history. 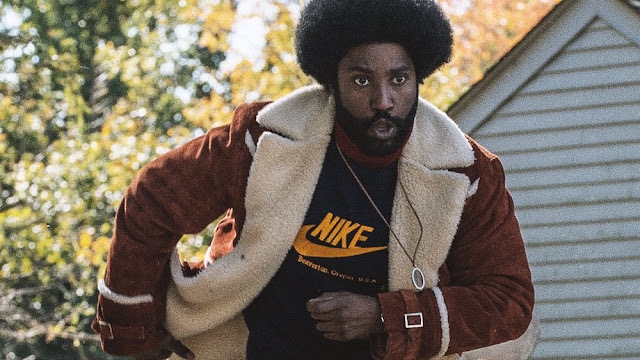 John David Washington (son of Denzel) stars as Stallworth in a delightfully stilted, laidback performance mimicking white mannerisms with all the black power style of the 1970s. His Jewish partner, a wiry Adam Driver, is tasked with inhabiting "white Ron" in person to further infiltrate the KKK's shenanigans. The whole team is an appealing bunch of misfits put in opposition with the bumbling gang of organized racists they are investigating. The comedic, over-the-top approach of the film only further highlights the very real sense of horror at the racial injustice and violence. It's often dizzying or disorienting but mostly captivating in how it tackles police action, makes racist men objects of ridicule, and contextualizes historical black suffering. The vivacious Laura Harrier with a spectacular afro further proves her star quality with a forceful performance as a black power leader. She lights up the screen with a soulful yet powerful screen presence. In stark contrast, Topher Grace inhabiting a young David Duke, Grand Wizard of the KKK, is completely comically irreverent in a pitch-perfect role for him. Grace's offbeat gentleman characterization mixed with Duke's abhorrent views is starkly compelling. Full of unusual tricks and asides from edited clips of Gone with the Wind and The Birth of Nation to a bizarre racial diatribe performed by Alec Baldwin, Lee's inditement of America's racial past informs his vision of the present. However, the anger is tempered with the sheer ridiculousness and comic value of the absurd situations the Colorado Springs Police Department gets into while investigating the KKK. BlacKkKlansman proves itself as an ultra-timely yet blunt commentary on contemporary identity politics using race as a reminder of our ills. The film weaponizes melodrama and Lee's cinematic understanding of history to put these stories into a greater whole. It's another searing portrait of fighting the power.